A type of woodpecker: a northern flicker. 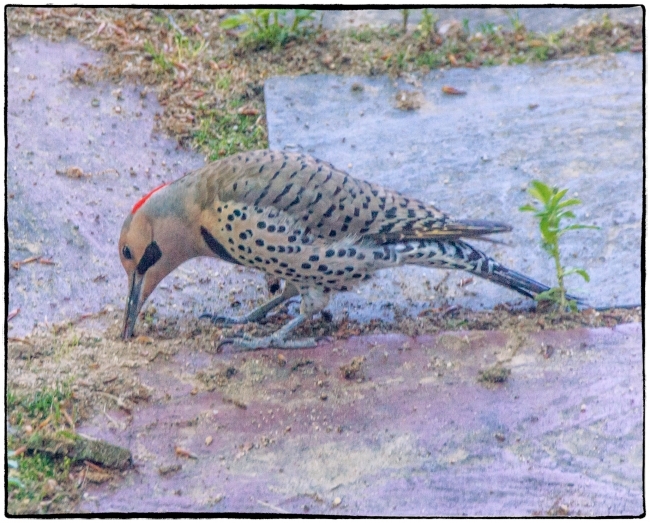 Specifically (if I’m not mistaken, which I might well be) a yellow-shafted flicker (Colaptes auratus auratus). So if it’s a woodpecker why is it chewing up our patio rather than pecking wood? Grab a worm on the patio or bang your head against a tree? I guess it’s an easy choice. As usual when I’m taken by surprise or my subject is moving I messed this up. When I noticed the bird I grabbed the nearest camera, which happened to my Sony Alpha 500 with Tamron A18 AF 18-250mm f3.5-6.3. Without thinking I zoomed in to the fullest extent not thinking that it as was relatively dark outside and that the combination of large aperture combined with large lens meant that that pictures were certainly going to suffer from blur resulting from the slow shutter speed selected and my inability to hand hold the lens at that speed. This is why I don’t do more wildlife photography. Still better than nothing though. I’ve never seen one of these before. This entry was posted in Sony Alpha 500, Tamron A18 AF 18-250mm f3.5-6.3, Wildlife & Animals. Bookmark the permalink.